Millions and millions of tiny vital life forces whirling through the body are concentrated into centers called chakras. Chakra means “wheel” in Sanskrit. They are called wheels because energies spin at these points, rotating clockwise at a certain frequency. The activity resembles a galaxy of planets, each spinning on its axis. The seven main chakras that you will learn about are located in the spinal cord region and are reflected, and felt after Self-Realization, in various parts of our bodies. 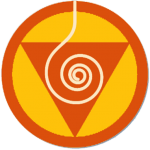 Each chakra is designed to supervise and maintain the perfect operation of the bodily systems under its control. An understanding of what each chakra attracts and what can disturb it is important for our well-being. Every thought and action influences the sensitivity and performance of these centers. As a beginner, the initial task is to clear away the gross negativity; this may take time but the results will be felt from the outset. 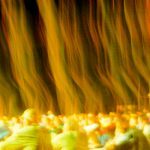 The source of all this information is available to you once you experience Self-Realization and your chakras are gradually cleared. The human subtle system is a vastly intricate one, made up of thousands of channels which carry energy throughout the body. The concentrations of the energy in the subtle system (the parasympathetic nervous system) are called chakras (“wheels” in Sanskrit) or energy centers. The entire system is governed by three primary vertical channels of energy (called “Nadis” in Sanskrit) and by seven main chakras. Our subtle system is fully activated only with the awakening of the Kundalini, which cleans and balances the entire system and enlightens the pure qualities of the chakras within us. 7. Sahasrara: The seventh center integrates all the chakras with their respective qualities. It is the last milestone of the evolution of human awareness. This chakra gives us the direct, absolute perception of Reality on our central nervous system. 5. Vishuddhi: The fifth chakra is the chakra of diplomacy, of pure relationships with others, and of playful detachment. It removes all our guilts and remorses when it is opened by the Kundalini, and gives us a kind and compassionate voice. 4. Anahata: The fourth chakra, the chakra of the heart, is the place where resides our Spirit, our true Self, which is eternally pure and unaffected by anything, like a shining diamond hidden within us which witnesses all our actions. 3. Nabhi: The third chakra is the one that gives us the sense of generosity, complete satisfaction and contentment. On the left side, the main quality of this center is peace – clearing this chakra can relieve stress and tensions. On the right side, it looks after our liver which is the organ of our attention and power of concentration. 2. Swadhisthan: The second chakra is the chakra of creativity, pure attention and pure knowledge. It is the one which connects us to the inner source of inspiration, and enables us to experience the beauty around us. 1. 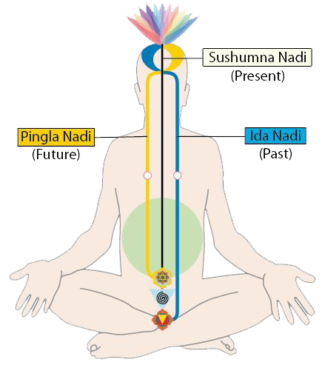 Mooladhara: The first chakra is situated below the sacrum bone in which resides the Kundalini, and its main aspect is the innocence. Innocence is the quality by which we experience pure, childlike joy, without the limitations of prejudice or conditionings. Innocence gives us dignity, balance, and a tremendous sense of direction and purpose in life. It is nothing but simplicity, purity and joy. Ida Nadi : The left channel (“Ida Nadi” in Sanskrit) is also called the Moon Channel. It begins at the Mooladhara (1st chakra) and runs up the left side, crossing over at the Agnya Chakra (6th center) into the temple and superego on the right side of the brain. It provides the conduit for the energy of our desire. Pingla Nadi: The right channel (“Pingala Nadi” in Sanskrit) is also called the Sun Channel. It begins at the Swadisthan Chakra (2nd center) and travels up the right side. It crosses over to the left temple (ego) at the Agnya Chakra. It provides the conduit for our active energy. This energy is comprised of our mental and physical activities. Sushumna Nadi: The central channel (“Sushumna Nadi” in Sanskrit) is also called the Middle Path. It begins at the place where the Kundalini resides and passes straight up the spine to the highest charka (the 7th or Sahasrara Chakra). Kundalini: It is the power of pure desire within us—a maternal, spiritual energy which resides in a latent state in the triangular sacrum bone at the base of the spine. (Sacrum means “sacred or holy bone,” from the ancient Greek, and is the medical term still used today.) The awakening of the Kundalini was always the goal of all the religions and all the spiritual traditions throughout the world. “The Kundalini cures you, improves you, and showers you with blessings. It keeps you free from all the problems of the material world,” says Shree Mataji, the founder of Sahaja Yoga. The picture on the left is one of the many photos which shows the Kundalini energy of the yogis who have been practicing Sahaja yoga is emerging from Mother Earth, while there are in deep meditation. Updated on 2017-09-03T02:27:05+00:00, by admin.